GALION — Parents are the first and most important line of defense against substance use for their children. Research shows that kids whose parents talk to them about the risks of drugs and alcohol are 50 percent less likely to develop a drug or alcohol problem in the future. In order to equip parents for those conversations, Marion Crawford Prevention Programs will be at Galion High School Tuesday, Oct. 30 and Thursday, Nov. 1 with their Hidden in Plain Sight presentation, as part of Red Ribbon Week activities. 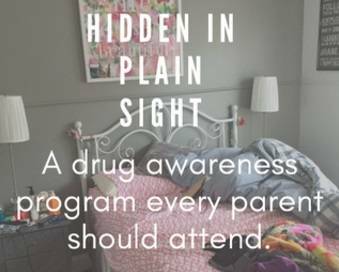 Hidden in Plain Sight is an interactive parent education program that walks parents through a virtual bedroom showing hidden and not-so-hidden signs of risky behavior and mental illness. After the room tour, parents will be discuss some of the items found in the room and learn about pertinent problems in the local community. They also will be provided with resources on how to talk with their children about these issues. There will be contact information for those who can help if a problem is discovered. The presentation will last about an hour and will be offered at 4 p.m., 5 p.m. and 6 p.m.. on both days. For more information or to schedule a time, please contact the high school at 419-468-6500.